Journal of Economics, entrepreneurship and law highlights the issues on intersection of economic and legal entrepreneuship aspects. The content includes papers on management, marketing, logistics, finance and personnel management and aspects of commercial and employment law. Please, submit your paper via epp@creativeconomy.ru. All submitted Research or Review manuscripts are subject to peer-review process. Piterskaya L.Yu., Tlisheva N.A., Piterskaya A.V. 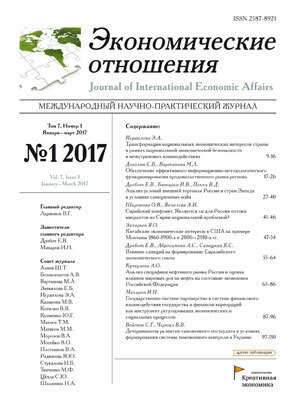 Khutorova N.A., Fofanova A.Yu., Kalmykov N.N., Antonova N.E., Kryuchkov A.N., Emelyanov A.V.